Child Sexual Abuse Awareness Month – CSAAM – is an annual awareness program organized by a voluntary collective of bloggers and social networks. It aims to break the deafening silence that surrounds this taboo topic. It targets parents, teachers and caregivers of children of both sexes and all ages, offering vital information on CSA, including an online collection of CSA-related resources. Fliplog is proud to be associated with the CSA initiative. Our contribution is an app for the iPhone and iPad devices. You can read survivor stories, expert talks, view Twitter updates, news, find videos and many more activities. To explore how mobile devices will impact cause based activism, we added feature where readers can participate via doodles. 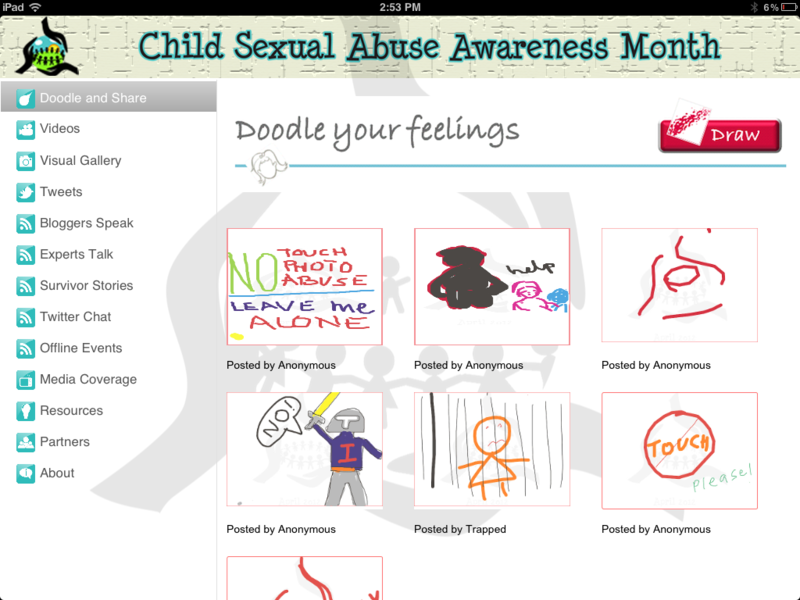 Express-via-doodle is a new way for users to come to terms with uncomfortable subject and still be able to express their feelings. But most importantly, please spread the word and participate in whichever form feasible. This is the worst kind of abuse imaginable and it scars our kids for their lives.